We’ve got Thunder basketball, Barons hockey and Redhawks baseball. Now, Oklahoma City has welcomed a brand new addition to the list of sports teams that get to call the 405 home. 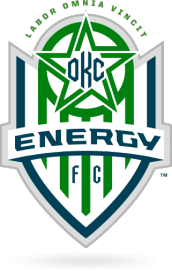 The Oklahoma City Energy FC is an American professional soccer team in the United Soccer Leagues’ Professional Division (USL PRO) and has recently moved to OKC. After deliberation, the team name “Energy” was decided on. Inspired by the industry that has become synonymous with Oklahoma, “Energy” also makes a bold statement about the city the team represents and the people who are proud to live and work here. Oklahoma City Energy FC is a metaphor of the great momentum present in Oklahoma City. The Oklahoma state flag and the state color, green, make up the foundation of the team logo. The logo features an exploding star, symbolizing the spark that initiates energy. The star also forms an abstract soccer ball with upward moving lines to create a sense of positive movement. Energy will play their regular season home and playoff games at Pribil Stadium on the campus of Bishop McGuinness Catholic High School in Oklahoma City. This will be the team’s home until their new stadium is built, which is rumored to hold 7,000 seats. OKC Energy FC has named former Sporting KC goalkeeper, Jimmy Nielsen, as the team’s head coach, Jason Hawkins as the team’s general manager and Chris Spendlove as an assistant coach. The 36-year old Nielsen recently completed his final game as a professional, serving as goalkeeper for Sporting KC in their win over Real Salt Lake in MLS Cup 2013 on December 7. A veteran of nearly 600 professional games, Nielsen brings a wealth of experience to his new position. Oklahoma City Energy FC have their first game on April 5th with the Orange County Blues FC at Los Angeles. Their first season opener home game is not until April 27th. Some people may feel that Oklahoma is out doing themselves, taking on all these sports franchises. However, it may just be the perfect time for all of them, as the city continues to grow and develop. If you are interested in this new addition to our state, or soccer is just your thing, then go check out their website at www.engeryfc.com. They have ticket options, rosters, schedules, article, and everything one could possibly want to know about the “Energy” that is about to spark Oklahoma.